With a guitar and a dance and a grateful beaming smile, Olga Jevtich ascended the royal throne as 2003 Ms Virginia Senior America. The Fairfax resident, topping seven other contestants for the coveted state crown Saturday, May 10, at the Fairfax High School auditorium, now gets an all-expense paid trip to Reno, Nevada in November, where she will vie for the prized national title. Born in Yugoslavia, the 2003 Ms Virginia Senior America Queen and her husband, a physician, fled Communist tyranny there in 1960 to take up a new life in the United States. And a new life it has been, sparkling with accomplishments: fashion design (her creations have appeared in the Washington Post, Smithsonian, fashion magazines). In 1985, Ms Jevtich was named "Woman Of The Year" by Washington Woman magazine. "She's a very gracious lady, has many talents. I just adore her, " said Pageant Director Pinky O'Neil, herself a Pageant Queen in l996. The Queen's many other talents? She's a volunteer producer for a cable access channel, is a fashion authority, attends monthly sessions of the Fashion Group International, enjoys a talked-about great cook reputation, and loves decorating. Judges gave the nod to the 69-year-old Queen after listening to her pluck a soothing folk melody on the guitar, then rise to her feet and perform a complementary folk dance, triggering spirited and warm applause from an audience of about three hundred. Ms. Jevtich said that in entering the Pageant she sought to send a message to the community that people who have reached the "age of elegance," can still lead active lives. "We're not just sitting in a rocking chair, we're doing something," said the Queen. 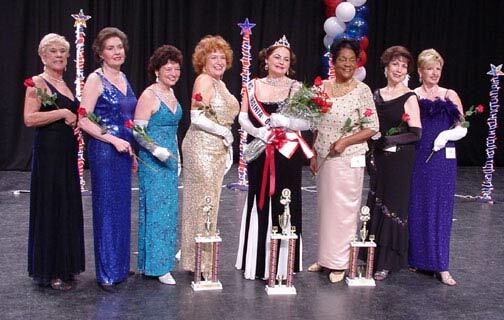 2003's Age of Elegance winners include Suzi Athanas of Virginia Beach, Virginia, first runner-up; Virginia Lane of Winchester, Virginia, 2nd; Pat King of Chesapeake, Virginia, 3rd; and Delores Champion of Virginia Beach, Virginia, 4th.